What can a wallpaper mural with textural pattern do for your space? 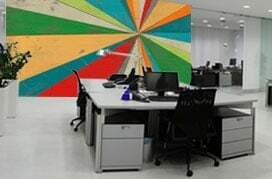 Be it your home, office, a lobby, restaurant or other commercial venue, a mural with textured pattern adds wow to your walls. It makes an excellent backdrop for conversation and entertaining. Textured patterns tend to stay on trend, and don’t fade out like the latest fad. So, when you choose a wallpaper mural with a textured pattern for your space, you’re investing in a look that will last. 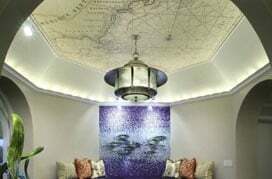 Why add a textural pattern mural to your wall? For one thing, it adds instant drama and intrigue to the setting. Even if your taste in furniture and accents leans towards the neutral, the addition of a patterned wall mural can be the element that creates a striking focal point. These beautifully designed wallpaper murals may be used in a number of ways. Add interest to your mantel wall with a brick pattern mural. Bring pop to the powder room with a tile or geometric pattern. Or create a cohesive look in your entire home with accents that feature the pattern found on your wallpaper mural. From illustrated animal stripes to seamless photographs of realistic patterns, our collection of murals offers you ample variety for every taste and style preference. What sets this collection of wallpaper murals apart is the fact the patterns, while being distinctive in their own way, are still versatile enough to be used anywhere. Unlike some patterns that are more suitable for children’s rooms, feminine or masculine spaces, this collection of murals with textural patterns would work well in any area of the home or a commercial space. Explore a wide range of decorating and styling possibilities for your space, from rustic to urban to contemporary with this handpicked collection of wallpaper murals of textural patterns.